Recently, the Jacksonville Jaguar Strength & Conditioning staff was in town to take a look at the ASAP~Athletic Strength And Power training complex located in Covington, Kentucky. Head Strength Coach Mark Asanovich and his assistant, Les Ebert were quite impressed with the facilities that are used for sports performance enhancement by ASAP Director Ted Lambrinides and his staff. 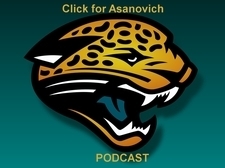 Asanovich and Ebert were able to spend a few minutes with ASAP Podcaster Ed Cicale in an interview where they discussed Coach Asanovich's recent trip to Japan (accompanied by ASAP-TAMPA~The Athletic Performance Center's Scott Savor and Tatsuya Okawa) the NFL Combine and strength training program design. Coach Ebert talked about the the interval training program presently being used by the Jaguars and about Pre-Exhaustion Training for strength development. Click on the Jaguar for the podcast. All Rights Reserved Copyright 2008 www.athleticstrengthandpower.com "ASAP~Athletic Strength And Power"